Caftan Woman: Billy Wilder Blogathon: "Rhythm on the River" and "The Emperor Waltz"
Billy Wilder Blogathon: "Rhythm on the River" and "The Emperor Waltz"
Those "Girls Gone Wilder", Kellee (Outspoken and Freckled) and Aurora (Once Upon a Screen), are hosting a birthday party/blogathon in honour of the inestimable Billy Wilder on June 22nd. I want to bring a little music to the festivities. 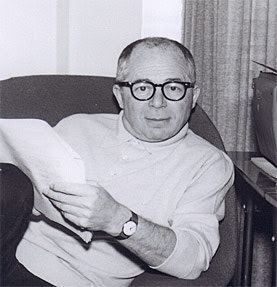 BILLY WILDER was a man of great intellect and wit. I never met the man, but I know this to be true because I am endlessly entertained and enlightened by the films he wrote and directed. Born in Austria-Hungary, Wilder got his start as a journalist and screenwriter in Germany and did not learn English until he moved to Hollywood in the 1930s. Yes, this man with English as a second language learned to use that language better than many born to it. Wilder was a screenwriter for over a decade before he added directing to his list of accomplishments. I'm going to look at two pictures from both sides of that career divide and both featuring Bing Crosby. Wilder is credited with the story for 1940s Rhythm on the River, Paramount's musical-comedy release directed by Victor Schertzinger. And what a story! In Rhythm on the River we get an inkling of the oddly clear-eyed view of show business mixed with sentimentality that would go to creating the classic Sunset Boulevard. Rhythm on the River's "Norma" is Oliver Courtney, a high-strung and famous Broadway composer played with amusing abandon by Basil Rathbone. Rathbone really should have done more comedies. Sadly, he has lost his muse and is "temporarily" and on the q.t. collaborating with composer Bob Sommers played by Bing Crosby. Bob is willing to go along with the arrangement for the money, for the chance to work with the great Courtney and with the hope that it will be his big break. However, Courtney is also "temporarily" collaborating with lyricist Cherry Lane played by Mary Martin. Cherry is willing to go along with the arrangement for the money, for the chance to work with the great Courtney and with the hope that it will be her big break. Only Courtney's transcriber and confidante Billy Starbuck played by Oscar Levant is, in his everlasting sarcastic way, in on the secret. Once that secret breaks however, Bob and Cherry form a professional and private partnership. The course of true love, alas, does not run smoothly. Oliver Courtney sees to that. Music publishers take care of scuttling the couple`s show business dreams as they already have a full catalogue of Courtney material. It is suggested that Bob and Cherry should try being more original. 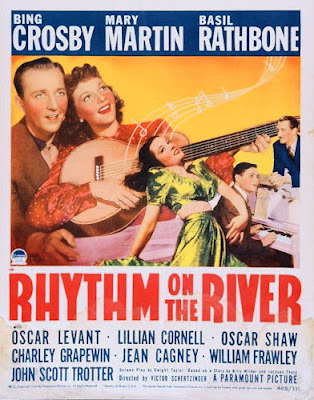 The rocky road to romance and show business success, and the comeuppance of Oliver Courtney makes Rhythm on the River a wonderfully entertaining movie with great songs, big laughs and charming quiet moment. All of this resting on the story by Billy Wilder. 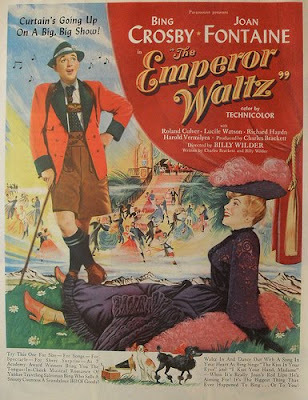 Billy Wilder and Charles Brackett wrote the script and Wilder directed 1948s The Emperor Waltz starring Bing Crosby and Joan Fontaine. It was Wilder's first picture since winning the Academy Award for writing and directing The Lost Weekend three years earlier. The Emperor Waltz would receive Oscar nominations for Edith Head's costumes and Victor Young's score. Our story is set in the long ago Austria of Emperor Franz Josef and concerns the love affair between a haughty widowed Countess Johanna Augusta Franziska (Fontaine) and a brash American salesman Virgil Smith (Crosby). Ditto her purebred poodle and his mutt. There is a lot of talk about class differences and bloodlines. Perhaps in the aftermath of WWII Brackett and Wilder felt the need to make some sort of a statement, but it's a tad heavy handed and at times detracts from the fun - and there is fun. The musical numbers are presented wittily and include Friendly Mountains (a yodeling song), The Emperor Waltz with Johnny Burke lyrics to Johann Strauss' melody and Jimmy Van Heusen and Burke's Get Yourself a Phonograph, the phonograph being Virgil's stock-in-trade. The old standby I Kiss Your Hand, Madame starts with Bing's vocal, then brings in a piano, then two policemen pick up violins and then the domestic staff starts to dance. When our countess swoons after a few boo-boo-boo's, you know it's all in fun. Billy Wilder has friendly fun with operetta and musical film conventions. The uninspired humorist often remarks when watching a musical "where did the orchestra come from?". There is no need to ask in the enchanting The Kiss in Your Eyes as an entire village puts bow to string to accompany this most stirring of love songs with lyrics by Johnny Burke to the melody from Richard Heuberger's Im Chambre separee from his 1898 operetta Der Opernball. It is one of the loveliest ballads Bing ever recorded and and Virgil's romantic overture is followed by a grand punchline from the Countess. The Technicolor is sumptuous and truly befitting the operetta-like sensibility of the movie. Location filming was done in Jasper National Park in Alberta. Apparently Wilder had pines transplanted from California, not being satisfied with our Canadian trees. One one hand I am mildly insulted, but on the other I am amazed at the resources of the studio and the clout of our director. Leading lady Joan Fontaine is every inch the royal lady, looking lovely in her costumes. The role is a nice transition from her young, vulnerable characterizations to the more confident and sophisticated females she portrayed in the 50s. Early in the film Bing tends to shout his way through Virgil, but his character is a lone fish out of water with no kibitzing pal such as a Bob Hope or Barry Fitzgerald. Once he starts to sing - well, like the Countess, it is easy to fall for the go-getting salesman. Lucile Watson (The Women, The Thin Man Goes Home) delightful as a dowager princess with a penchant for storytelling. Our Countess' profligate father played in fine style by Roland Culver (The Life and Death of Colonel Blimp, The Holly and the Ivy). It is a genuine treat to watch Richard Haydn as Emperor F-J. Unrecognizable under the whiskers and make-up, and foregoing his famous precise nasally delivery, Mr. Haydn gives us a very interesting Franz-Josef. A petulant, funny, irritating, thoughtful and memorable character. Despite the somewhat overly-preachy aspects of the script and a tendency to drag in spots, The Emperor Waltz is redeemed by the accomplished actors, lovely music, gorgeous scenery, sumptuous cinematography and grand costumes. I especially enjoyed Billy Wilder's cheeky fun with his handling of the musical moments. He poked fun at the conventions while taking nothing away from the beauty of song. All-in-all a very interesting movie in Billy Wilder's extensive filmography. Wilder only mentions RHYTHM briefly in CONVERSATIONS WITH WILDER, so I didn't recognize the title at first. According to him, the story was his, but only one detail of it ended up in the screenplay. He didn't say which. One day I'll have to see WALTZ just to see what a Wilder musical looks like. In that case, I can only imagine which detail is Wilder's and I choose to believe that would be the crux of the whole thing - the Oliver Courtney cover-up. I didn't think too much of "The Emperor Waltz" on my first viewing. I don't know what I expected from a Wilder musical, but I guess that wasn't it. Second time around I relaxed and enjoyed the thing. Two very neat choices for a Wilder blogathon, and I like this: "Yes, this man with English as a second language learned to use that language better than many born to it. " Reviews as charming as the films. Thank you. With his best work, Wilder makes the audience feel his equal, that we have some of his special qualities and insights. Great choices for the blogathon - neither of which I've seen. A musical wouldn't be high on my expected Wilder genre list, but I can imagine that he was able to pull everything off with fun and aplomb - drawing on his childhood to fill it with lots of authentic cliches! Your very old account has a very cool name. A musical does rather stand out and it gives us another side of Wilder. It was music by Rozsa that inspired "The Private Life of Sherlock Holmes". I wonder what other inspiration he found in melody. Two Wilder films that I have not seen, but both are now on my list of must see films. Thanks for sharing. I think you'll have fun. Basil Rathbone truly should have done more comedies! I'm another one who hasn't seen either of these. I'm especially keen to see "Rhythm on the River" just for Basil Rathbone's comedic performance. Rathbone and Levant could have gone on the road with their act! I'm sure you'll get a kick out of it. I love Joan Fontaine so I'm very curious about seeing The Emperor Waltz! I must admit, I never heard of Rythme on the River before, but that's looks like another interesting one. Thanks for the great reviews! Thanks a lot. I'm sure you will find many things in both movies to enjoy.